Our neighbor has once again given us a great project to work on. He was responsible for the iron piece in our pallet table. Now the other day he saw us outside and asked if we wanted his grandmother's table. Apparently this table sat in her dining room for quite some time, and then had been in his basement for a number of years. The pictures were taken with my phone so they are a little dark. 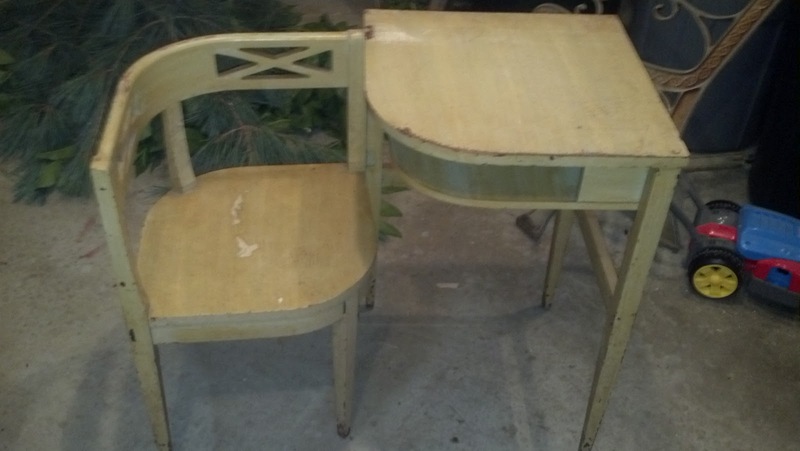 It was essentially a dark yellow table before. 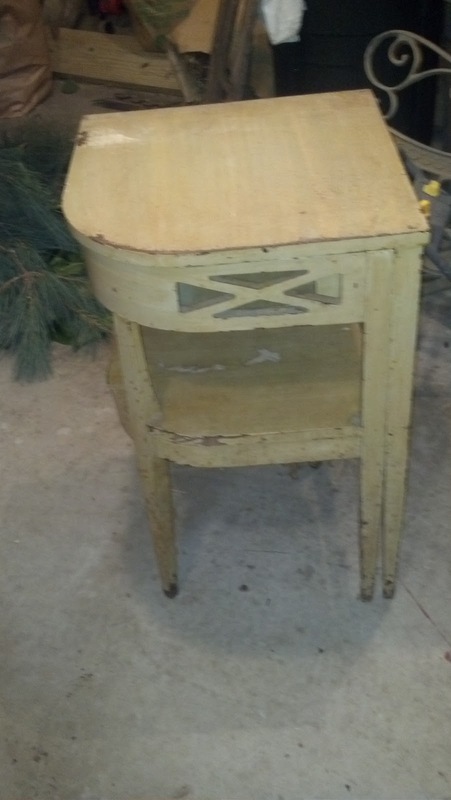 The best part of this table is that it is a telephone table and the chair pulls out. How cute is this? Rob stripped and sanded down all the old paint that was chipping, and then wiped it down with some mineral spirits. We wanted to put this in a room that already has gray colored furniture, so we were able to reuse paint we already had. This saved some money, and it turned out great. The color is by Valspar and the name is Woodlawn Colonial Gray. 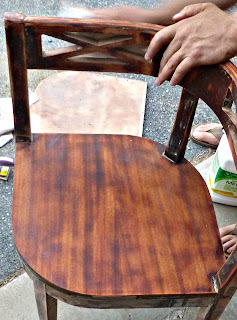 Here is the chair seat painted after the first coat. Rob gave the top of the table at coat of stain, and painted the legs of it to match the chair section. It took several coats of paint and a lot of hand sanding it between to get good coverage over the dark wood. It can even be a laptop desk instead of telephone table now. Or you can leave it put together and have it as an occasional table or night stand. Thanks for stopping by! Enjoy your evening. That piece really is so unique! I have never seen anything like it. Rob did a beautiful job! ... And that sewing cabinet looks great as a bedside table. So nice to see you again Megan! Oh my goodness this is great! I want to get my hands on one of those Gossip Chairs! They are so fun!! You guys did a great job with this! What a cute set!! You guys did an amazing job!! I love the two tones you gave it!! Very cute- like the transformation! I wish my neighbors had great stuff they wanted to share. You guys are SO creative! I'm wishing YA'LL were my neighbors so I could learn to do what you do! I've seen many gossip tables but never one that pulls out like this one. I wish your neighbor was mine cause he sure is good to you! The table really turned out so pretty, and love how her front details stand out now. It's so functional, chair to table to gossip. Very creative couple you are! My fingers are crossed you'll share with Sunday's Best tonight - too darn pretty not too! I was tickled pink your shared this - it really is to cute! So wish I had one, so if your neighbor gives you another one, save it for me! So glad you shared your creative inspiration with Sunday’s Best – your creativity helped make the party a success! What a cute little set. I love how you can use it together or as two separate pieces. Nice makeover! That table is awesome! Such nice neighbors! I love that the chair can fold in.. I am going to be on the hunt for something similar! I am so glad I found your blog and am your newest follower! If you ever have time come check out mine! Ahhh! I see, it took me a few looks to understand how it works but now I see how the chair part folds out. Very cool! Great make over. Thanks for sharing at Etcetorize this week! Oh wow! My mom was just telling my girls how she had a table like this in her house when she was little. I'll have to show it to them. Nice transformation! great job on this furniture makeover!!! This is such an original piece!! Gosh I would love to put my hands on one of those!! You did such a beautiful job! I LOVE unique pieces like this! You did a great job on the makeover! Thanks for sharing at Terrific Tuesdays. The table looks great!! Thanks for sharing at Romance on a dime's TIOT party!! Best computer table EVER! I am going to be on the lookout for one of those, although I've never seen one that folds in before! It turned out fabulous and you have awesome neighbors!